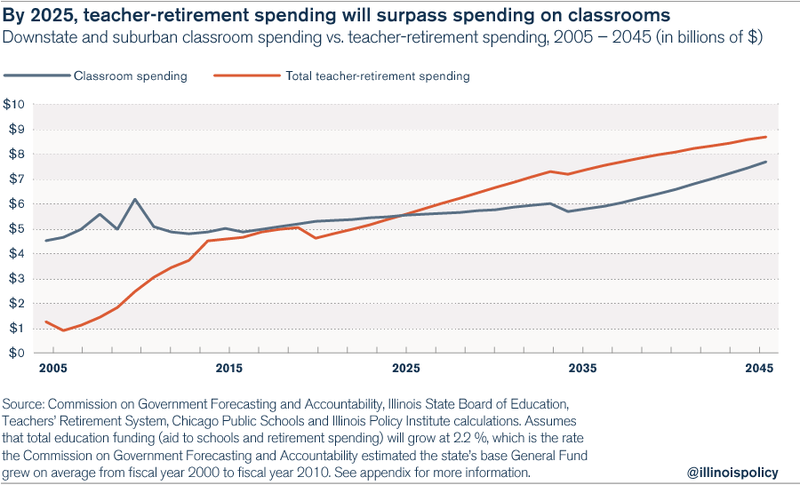 Illinois’ growing pension costs – not the state budget gridlock – are taking away funding for essential government services, such as education. Reyna Montes, a parent and education activist in Waukegan, Ill., has fought for more than a year for a full-time college counselor at Waukegan High School, where just 18 percent of students graduate college- or career-ready. The high school says it doesn’t have the money to hire a college counselor. No money is also the excuse just 40 miles south at Chicago State University, where student Charles Preston’s grants have been cut, according to NBC News. University officials say they don’t have the money to help Preston because the Illinois General Assembly has yet to appropriate funds to the university this year. Both Montes and Preston instinctively blame Illinois’ budget stalemate for their troubles. Illinois has been operating for nearly eight months without a state budget, and the effects are rippling through the state. But to a large extent, their blame is misplaced. 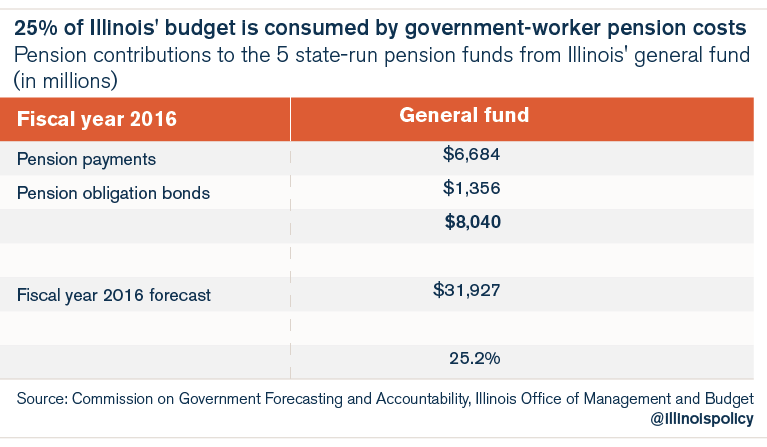 While the budget crisis is causing immediate funding problems, it’s the Illinois pension mess that’s really causing all the pain. What many people like Montes and Preston don’t realize is that government spending for education – and for every other core service on which the state spends – is being overwhelmed by government-worker pension costs. Skyrocketing pension costs are leaving fewer dollars for everything else, including counselors and college grants. Today, more than 25 percent of the state’s $32 billion budget (what’s typically called the general fund) is being consumed by pension costs for downstate and suburban teachers, public-university and college workers, state employees, judges and state lawmakers. That’s a record amount. By comparison, other states spend a fraction of that amount on government-worker pensions. An analysis by Moody’s Investors Service just two years ago showed that at that time, Illinois spent 19 percent of state revenues on pensions, while the 50-state median in the U.S. was just 4.1 percent of state revenues. The situation for Illinois is even more dire when the state’s appropriations to K-12 and higher education are analyzed more deeply. State appropriations to K-12 education have risen by more than 6.2 percent yearly since 2006, a pace that is nearly three times the rate of inflation and more than enough to support new and better education programs for the entire state. But the majority of the new money going toward education never makes it to the classroom. Instead, the overwhelming majority of new education dollars fund skyrocketing pension costs. Those costs have risen so much that today nearly half of all education funding appropriated by the General Assembly goes toward pensions. Funding for the classroom and other operations has remained virtually flat over the last decade. The same story is playing out in higher education, where the state appropriates more than $4 billion to its public universities and colleges, and yearly appropriations have grown at an annual pace of 5.5 percent for the last decade. 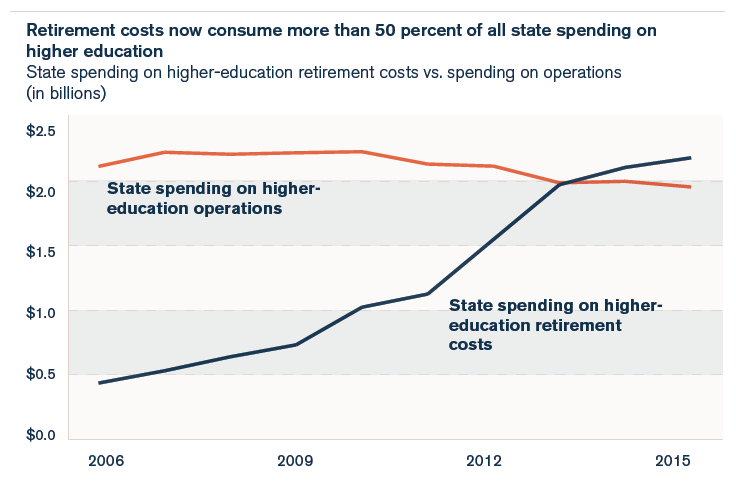 Today, more than 50 percent of state higher-education appropriations go toward the pension and retirement costs of university and college workers. What’s available to fund daily operations and grants continues to decline as pensions crowd out funding for students. Illinois’ budget gridlock is certainly contributing to the pain felt by some Illinoisans and groups who’ve become dependent on state funding. But it’s not the root cause of the problem. Instead, the budget crisis is exposing the massive cracks in education funding caused by the pension crisis. Budget or no budget, there’s no fixing education funding – whether it’s for the Chicago Public Schools or school districts and colleges across the state – without tackling pension reform.